The definitive Russian stamps of 1889 to 1912 went through some significant changes. 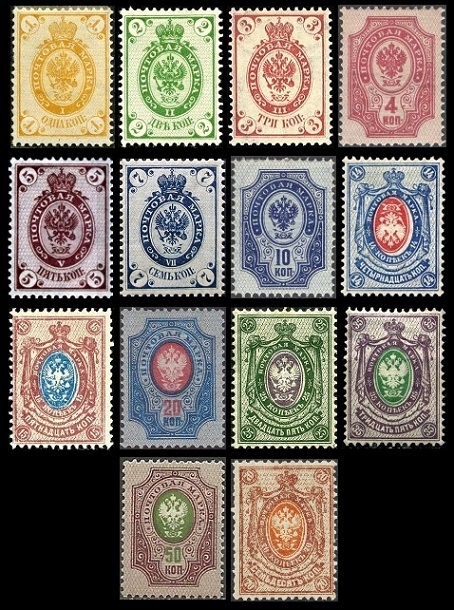 All of the Imperial Arms definitive stamps, beginning with the issues of 1889, have thunderbolts across the post horns. A new security measure to prevent the soaking and re-use of postage stamps was implemented in 1909, and it worked so well that the Austrian Empire copied the process for their contemporary definitive postage stamps. There were also many production errors during this period that many of them are actually well within the financial means of most serious collectors. The sheet-watermark shown above, was used for Russian stamps between 1866 and 1906. WMK 168 goes across the sheet, so an individual postage stamp will show only a portion of the watermark, usually a section of one of the wavy lines. The fourteen major denomination-type Imperial Arms Russian stamps shown above were issued between 1889 and 1905. The stamps all have thunderbolts across the post horns, and they are perforated 14 to 15 and compound. 01 K. (1889 - Sc. #46) - Orange. 02 K. (1889 - Sc. #47) - Green. 03 K. (1889 - Sc. #48) - Carmine. 04 K. (1889 - Sc. #41) - Rose. 05 K. (1889 - Sc. #49) - Red Violet. 07 K. (1889 - Sc. #50) - Dark Blue. 10 K. (1889 - Sc. #42) - Dark Blue. 14 K. (1889 - Sc. #51) - Blue & Rose. 20 K. (1889 - Sc. #43) - Blue & Carmine. 35 K. (1889 - Sc. #52) - Violet & Green. 50 K. (1889 - Sc. #44) - Violet & Green. 01 K. (1902 - Sc. #55) - Orange. 02 K. (1902 - Sc. #56) - Yellow Green, Deep Green. 03 K. (1902 - Sc. #57) - Rose Red. 04 K. (1904 - Sc. #57C) - Rose Red. 05 K. (1902 - Sc. #58) - Red Violet, Dull Violet. 07 K. (1902 - Sc. #59) - Dark Blue. 10 K. (1904 - Sc. #60) - Dark Blue. 14 K. (1902 - Sc. #61) - Blue & Rose. 15 K. (1905 - Sc. #62) - Brown Violet & Blue. 20 K. (1904 - Sc. #63) - Blue & Carmine. 25 K. (1905 - Sc. #64) - Dull Green & Lilac. 35 K. (1902 - Sc. #65) - Dark Violet & Green. 50 K. (1905 - Sc. #66) - Violet & Green. 70 K. (1902 - Sc. #67) - Brown & Orange. The five major high-denomination-type Imperial Arms Russian stamps shown above were issued between 1889 and 1906. The stamps all have thunderbolts across the post horns, and they are perforated 13 1/2. 01.00 R. (1889 - Sc. #45) - Light Brown, Brown, & Orange. 03.50 R. (1889 - Sc. #53) - Black & Gray. 07.00 R. (1889 - Sc. #54) - Black & Orange. 01.00 R. (1902 - Sc. #68) - Light Brown, Brown, & Orange. 03.50 R. (1902 - Sc. #69) - Black & Gray. 05.00 R. (1906 - Sc. #71) - Dark Blue, Green, & Pale Blue. 07.00 R. (1902 - Sc. #70) - Black & Orange. 10.00 R. (1906 - Sc. #72) - Carmine Rose, Yellow, & Gray. Beginning in 1909, the Russians experimented with varnish coating on definitive stamps, to prevent their cleaning and re-use. For the philatelist, this resulted in the creation of many minor collectible varieties. 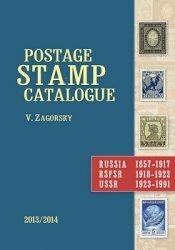 Additionally, the stamps of the Russian Empire were produced, in various forms, well into the Civil War period, which can yield even more philatelic varieties. In some cases the lozenges of varnish are barely discernible. In other cases, the varnish is so heavy that it distorts the appearance of the stamp. A margin copy with very distinct lozenges is shown above. The best detection method is to place the stamp in front of a bright light and then examine the stamp surface by looking across the surface of the stamp from one of the edges. The lozenges should appear as irregular light discoloration spots against the surface of the stamp. 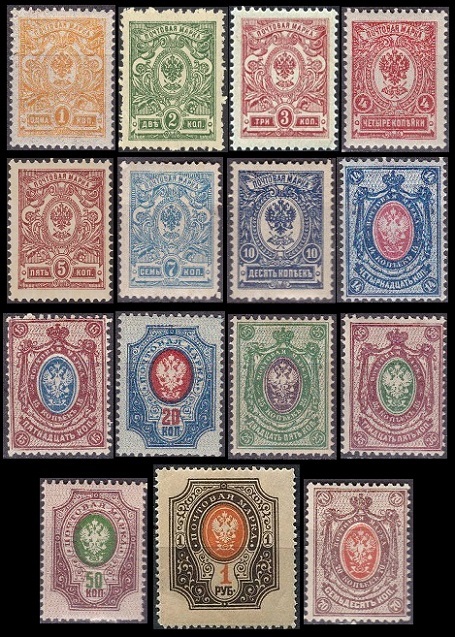 The fifteen Imperial Arms Russian stamps shown above were issued in 1909, with additional printings through 1912. 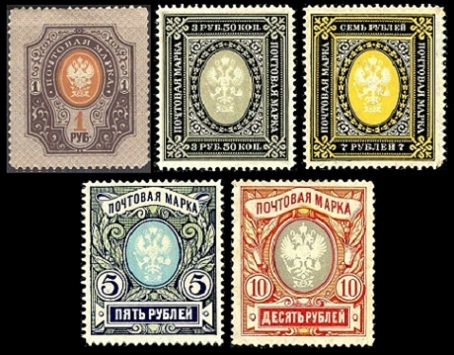 The stamps are printed on unwatermarked, wove paper, with vertical lozenges of varnish on the surface, and they are perforated 14 x 14 1/2, except for the 1 Ruble denomination, which is perforated 13 1/2 or 12 1/2. 01 K. (1909 - Sc. #73) - Orange Yellow. 02 K. (1909 - Sc. #74) - Green. 03 K. (1909 - Sc. #75) - Carmine, Rose Red. 04 K. (1909 - Sc. #76) - Carmine, Carmine Rose. 05 K. (1909 - Sc. #77) - Claret, Lilac. 07 K. (1909 - Sc. #78) - Blue, Light Blue. 10 K. (1909 - Sc. #79) - Dark Blue, Light Blue, Pale Blue. 14 K. (1909 - Sc. #80) - Dark Blue & Carmine. 15 K. (1909 - Sc. #81) - Red Brown & Deep Blue, Dull Violet & Blue. 20 K. (1909 - Sc. #82) - Dull Blue & Dark Carmine, Blue & Carmine. 25 K. (1909 - Sc. #83) - Dull Green & Dark Violet. 35 K. (1909 - Sc. #84) - Red Brown & Green, Brown Violet & Yellow Green, and Violet & Green. 50 K. (1909 - Sc. #85) - Red Brown & Green, Violet & Green. 70 K. (1909 - Sc. #86) - Brown & Red Orange, Light Brown & Orange. 01 R. (1909 - Sc. #87) - Pale Brown, Dark Brown, & Orange. There are a lot of errors and varieties on most of these Russian stamps. Please see the standard catalogs for details.